Water bottle skirt tatted by Denice. Denice has a beautiful water bottle skirt that she tatted. I love the bead selection she used. It is beautiful and now I want to make my own! Thank you for sharing Denice! Sherry has been working on some lovely hearts! Her tatting is amazing! If I recall correctly, she also said she is working on snowflakes and has over 60 complete (I’m super impressed)! She is a busy tatter and I look forward to seeing what she tats next! Thank you for sharing Sherry! Want to learn how to tat? Join us the 2nd, 3rd, & 4th Tuesdays of September, October, and November from 5:30 pm – 8:00 pm at Lidgerwood Presbyterian Church – 4449 N Nevada, Spokane WA 99207. Classes are learn at your own pace by design with individual instruction and attention. You do not have to commit to attending each class and missing a week doesn’t mean you miss learning a skill – it will be waiting to be taught the next time you are back. Thread will be provided. Shuttles will be available for purchase at class or may be purchased at Sew E-Z or Hobby Lobby. Demo shuttles are also available for use during the class. 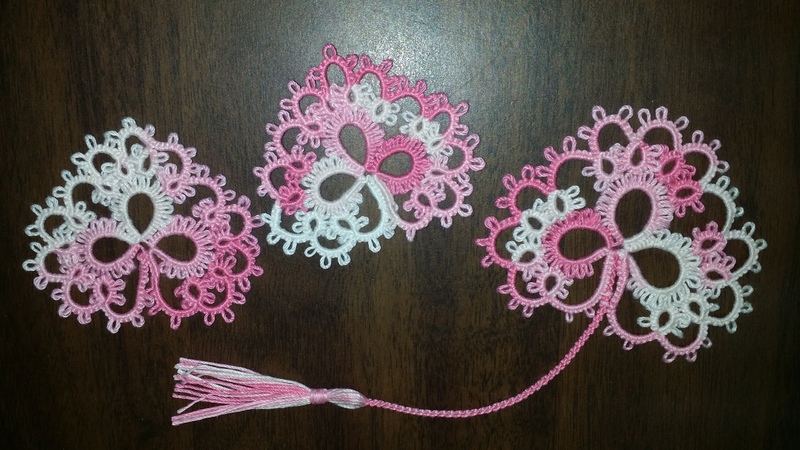 So come learn the basics of your new tatting hobby before purchasing your own supplies. See you tonight at 5:30 pm! 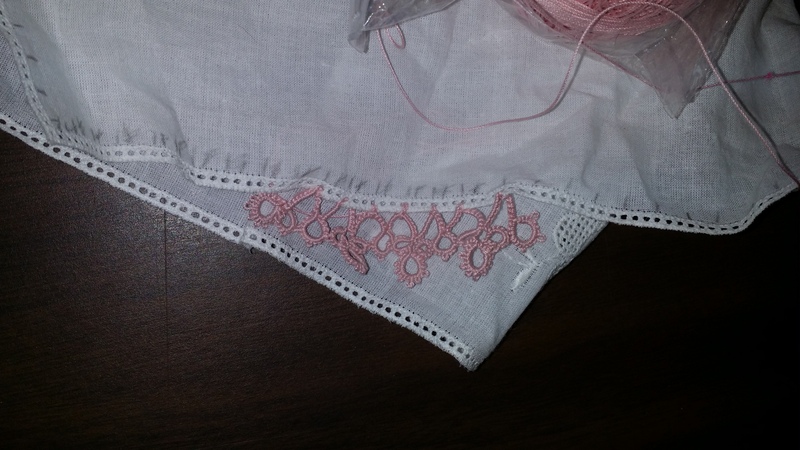 Glenda is working on a beautiful handkerchief edging. I look forward to seeing this piece when it is complete. Thank you for sharing it with us Glenda! Design The 2015 Shuttlebirds Workshop T-Shirt! You have 18 days left to get your awesome logo design in! Have you ever imagined one of your tatting designs on a t-shirt? You have the chance to design the 2015 Shuttlebirds Workshop T-Shirt Logo! Entries need to reflect the theme. The design must be ‘tat-able’ or tatting related. A t-shirt with the winning logo will be awarded for the winning design. I look forward to seeing your creativity! You have 23 days left to get your awesome logo design in! Back view of baby bonnet tatted by Kathleen Minniti. Beautiful baby bonnet tatted by Kathleen Minniti. 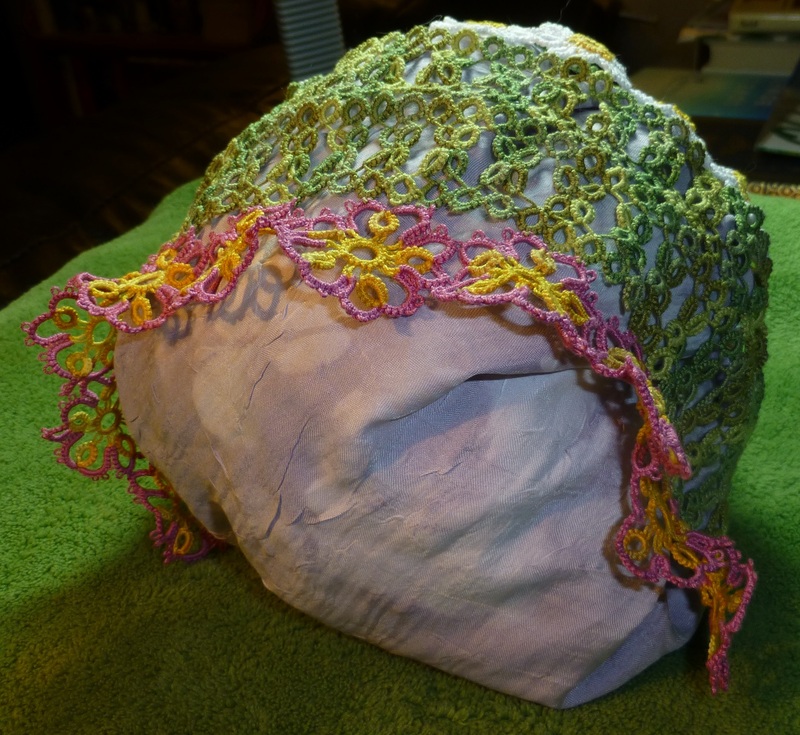 Another view of the baby bonnet tatted by Kathleen Minniti. 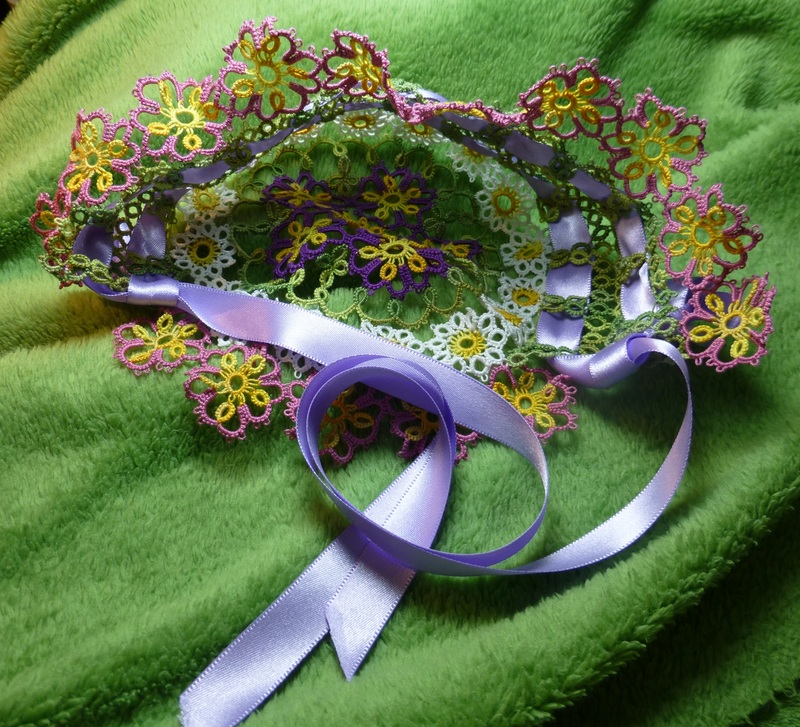 Front view of the beautiful baby bonnet tatted by Kathleen Minniti. 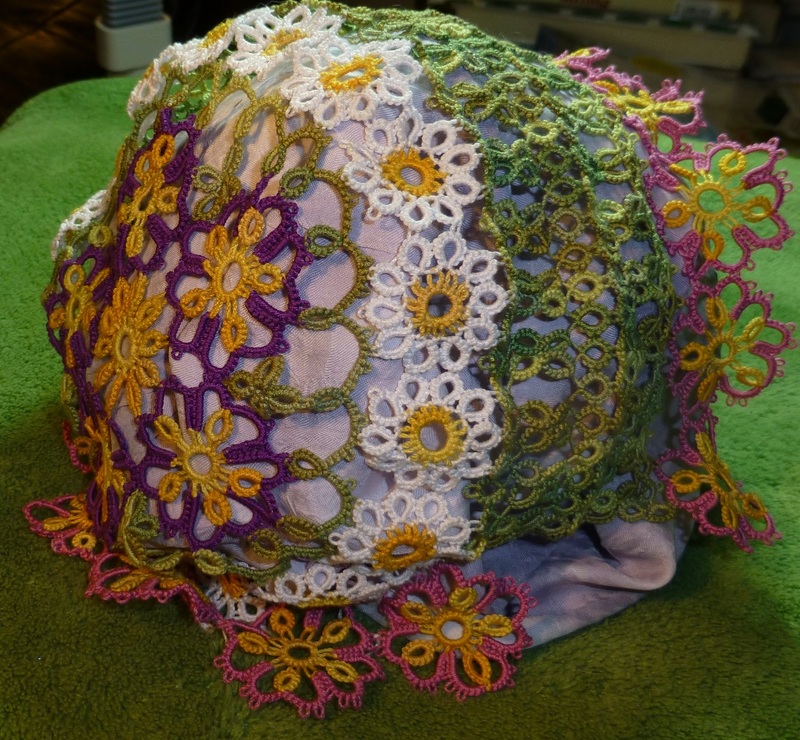 Kathleen has tatted an adorable baby bonnet from Nellie Hall-Youngburg’s, Forty Original Designs in Tatting. It is tatted in Lizbeth, size 20 thread. A busy tatter, Kathleen has already worked up a second bonnet in white. Thank you for sharing Kathleen! The 19th Annual Shuttlebirds Workshop will be held April 17th and 18th of 2015 in Spokane, Washington. The theme for the workshop is “A Touch of Victorian Charm”. There are 290 days left before the deadline for entry into the theme contest (283 if you are entering by mail). frilka – I can’t wait to see what you tat up! I’m especially excited because you’ve decided to do something for the steampunk category! Yes! This contest is open to tatters everywhere. Attendance at the workshop is not required. How Many Entries May I Submit? There is a limit of two entries per category (12 entries at the moment – more, if additional categories are added). 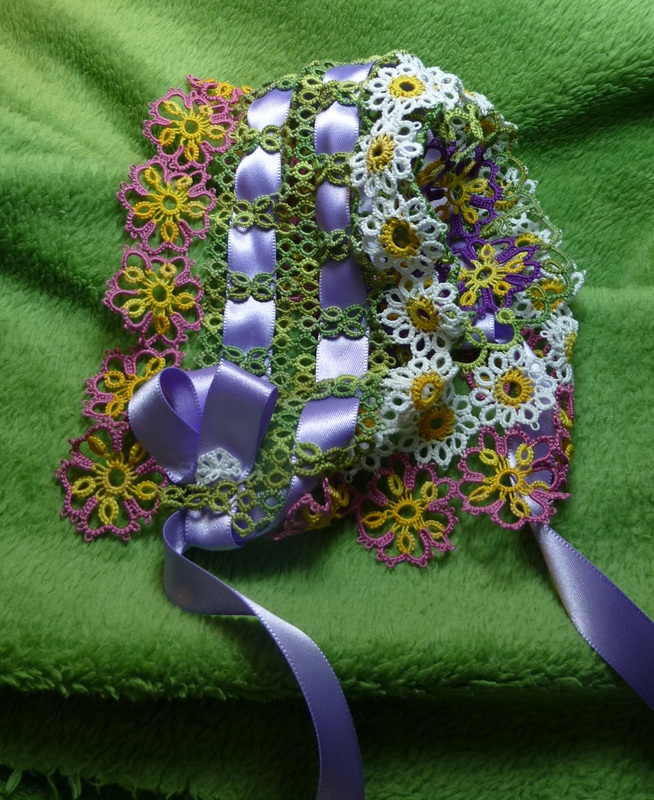 Entries may be from a published pattern, an adaptation of a pattern, or original design. Entries from a published pattern must list the source of the pattern. Adaptation entries must include a picture of the original pattern for comparison. Each entry must be submitted with a completed entry form (I will let you know when entry forms are available) and received by noon, Friday, April 17, 2015 for those attending the workshop. Entries submitted by mail must be received by Friday, April 10, 2015. Please include a completed entry form for each entry, a return label address, and sufficient postage for returning your entry after workshop (if you plan to attend the workshop on Saturday, return postage is not necessary). Or you can send your entry with someone you know that plans to be at the workshop before noon on Friday, April 17th. There will be one winner per category. Judging will be by popular vote of the workshop attendees, with one vote per person per category. When Do I Find Out If I Won? Winners will be announced on Saturday afternoon, April 18, 2015, at the workshop. Winners will then be announced online within 48 hours of the end of workshop. How Do I Get My Prize? Winners attending the workshop will be awarded prizes after winners are announced. Winners who submitted by mail will receive their prizes when their tatted entries are returned to them. That, my friend, is a secret that will be revealed Friday, April 18, 2015. So what are you waiting for? Pick a category, grab your shuttle, and get tatting! I would love to see your tatting! There are so many lovely things that can be made. 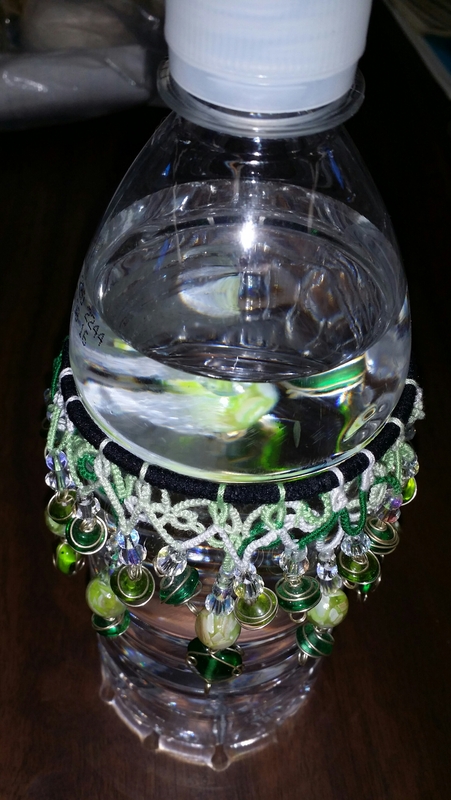 Please consider sending in your amazing tatting so that we can all oooo and ahhhhh over it next April! Start planning your entries now. Make sure you follow our blog so that you don’t miss the monthly reminders about this contest. If you comment below that you plan on participating in this contest, I will make sure to cheer you on by name in each contest reminder. I want to see your “touch of Victorian charm” on display in April!